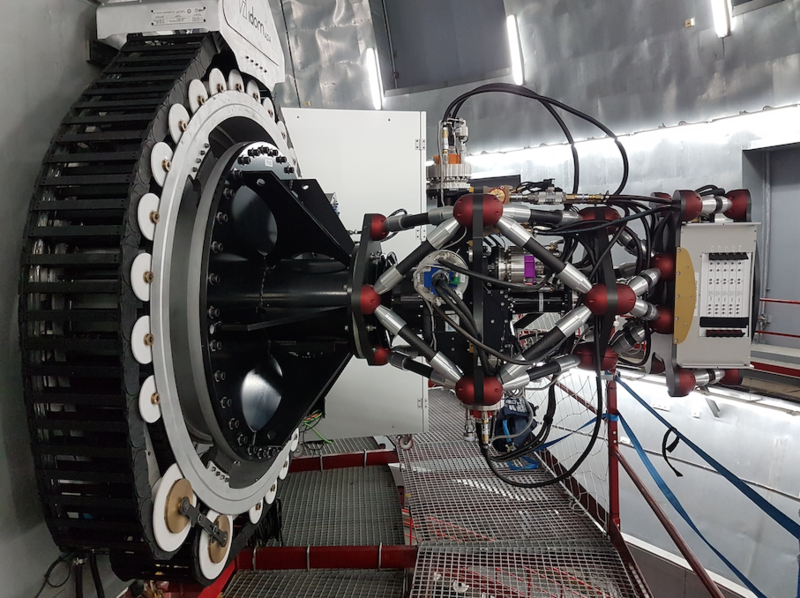 HiPERCAM is a state-of-the-art, quintuple-beam imager that saw first light as a Visitor Instrument on the GTC in February 2018. The instrument uses re-imaging optics and 4 dichroic beamsplitters to record ugriz (300-1000nm) images simultaneously on its five CCD cameras. The detectors in HiPERCAM are frame-transfer devices cooled thermo-electrically to -90°C, thereby allowing both long-exposure, deep imaging of faint targets, as well as high-speed (over 1000 windowed frames per second) imaging of rapidly varying targets. HiPERCAM was funded by a €3.5M European Research Council Advanced Grant awarded to Vik Dhillon, and was designed and built by a consortium from the Universities of of Sheffield, Warwick, Durham, the UKATC and the IAC. As HiPERCAM is a Visitor Instrument, this web page gives only a minimal amount of information. Users are invited to visit the full HiPERCAM web site. HiPERCAM is able to image simultaneously in 5 channels (ugriz), rather than the 3 channels of its predecessor, ULTRACAM. HiPERCAM is able to frame at (windowed) rates of over 1 kHz, rather than the maximum of ∼400 Hz available with ULTRACAM. HiPERCAM has a field of view of 2.8’ x 1.4’ on the GTC (3.1’ across the diagonal), greater than that of ULTRACAM on the VLT. This ensures that more comparison stars are available for differential photometry, allowing brighter targets to be observed, such as the host stars of transiting exoplanets. 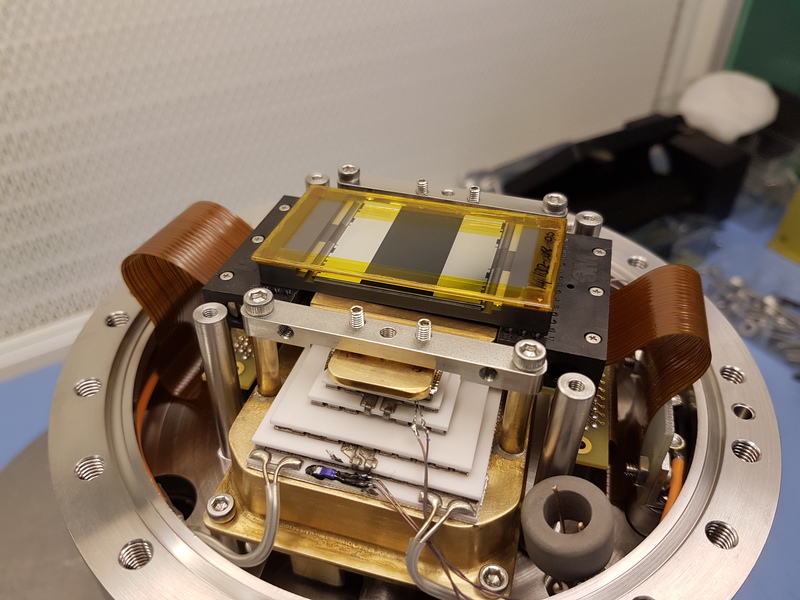 In short, HiPERCAM provides an order-of-magnitude improvement over ULTRACAM, thereby revolutionising the field of high-speed optical astrophysics. Operationally, HiPERCAM has adopted the successful ULTRACAM model. Hence, HiPERCAM is a Visitor Instrument, seeing first light on the 4.2m WHT on La Palma during October 2018, and first light on the 10.4m GTC on La Palma during February 2018. The instrument will be based at the GTC until at least 2020. Throughput curves for HiPERCAM in ugriz. These curves do not include the atmosphere or telescope. 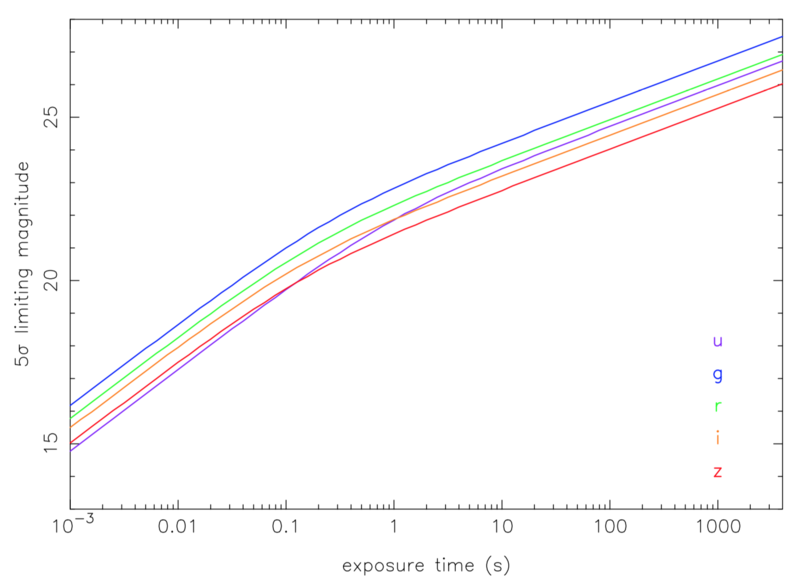 Limiting magnitudes (5σ) of HiPERCAM on the GTC as a function of exposure time. The purple, blue, green, orange and red curves show the results for the u' g' r' i' z' filters, respectively. The calculations assume dark moon, observing at the zenith and seeing of 0.8”. HiPERCAM is a high-speed, quintuple-beam CCD camera for the study of rapid variability in the Universe. 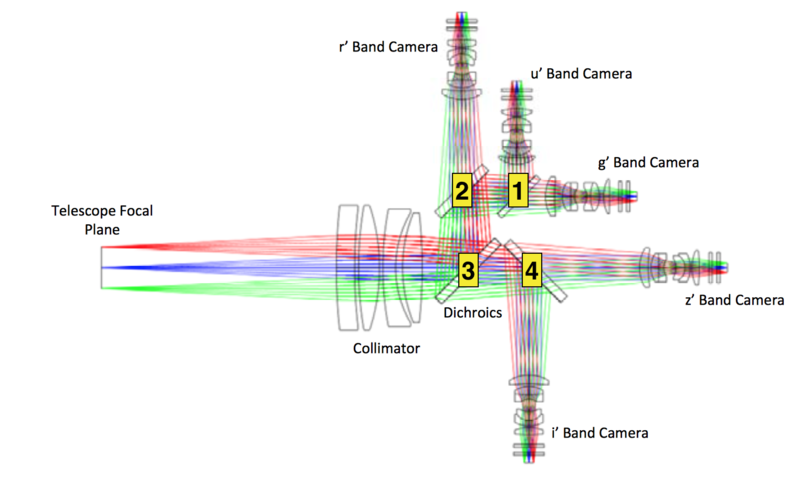 Light from the telescope is first collimated and then split into five beams using four dichroic beamsplitters, as shown below. The beam in each arm then passes through a re-imaging camera, which focuses the light through a bandpass filter and detector-head window onto a CCD. The HiPERCAM collimator has been designed for use on both the 4.2m WHT on La Palma and the 3.5m NTT on La Silla, giving a platescale of 0.3''/pixel and 0.35''/pixel, and a field of view of 11.4' and 13.4' across the diagonal of the detector, respectively. The same collimator also gives excellent optical performance on the GTC, giving a platescale of 0.081''/pixel and a field of view of 3.1' (diagonal). A new collimator designed specifically for HiPERCAM on the GTC, giving a platescale of 0.113''/pixel and a field of view of 4.3' (diagonal), has been designed but not yet procured. Top: Ray-trace through the HiPERCAM optics. The dichroic numbering convention is marked. Bottom: As-built transmission profiles of the HiPERCAM “Super” SDSS filters (solid lines), the HiPERCAM “original” SDSS filters (dotted lines), and the four HiPERCAM dichroic beamsplitters (dashed lines). HiPERCAM mounted on the Folded Cassegrain focus of the GTC. HiPERCAM uses frame-transfer CCDs cooled to 183 K, with deep-depletion CCDs in the red channels, each equipped with anti-etaloning, resulting in low dark current, high QE and low fringing. Hence, as well as high-speed work, HiPERCAM is ideal for scientific applications requiring deep (i.e. long exposure), single-shot spectral-energy distributions (SEDs), such as supernova light-curves, gamma-ray bursts and other transients. Left panel: HiPERCAM detector and camera head. Right panel: HiPERCAM CCD architecture. The figures below show the hardware architecture of the HiPERCAM data acquisition system. It can be seen that the instrument is composed of 4 components which are located in 4 different places at the telescope: the instrument on the Folded Cassegrain port; the electronics rack on the elevation ring (and close to the instrument); the data reduction PC (DRPC) and its peripherals in the control room; and the GPS antenna mounted externally to the dome. The ESO New General detector Controller (NGC) is mounted on the instrument in order to minimise the lengths of the video and clock/bias cables to the 5 HiPERCAM CCDs. The power for the NGC comes from a Power Supply Unit (PSU) mounted in the HiPERCAM electronics rack, which is located adjacent to the instrument on the GTC elevation ring. Control of the NGC and receipt of data from the CCDs is via a fibre running between the ESO rack PC in the electronics rack (marked LLCU) and the NGC. 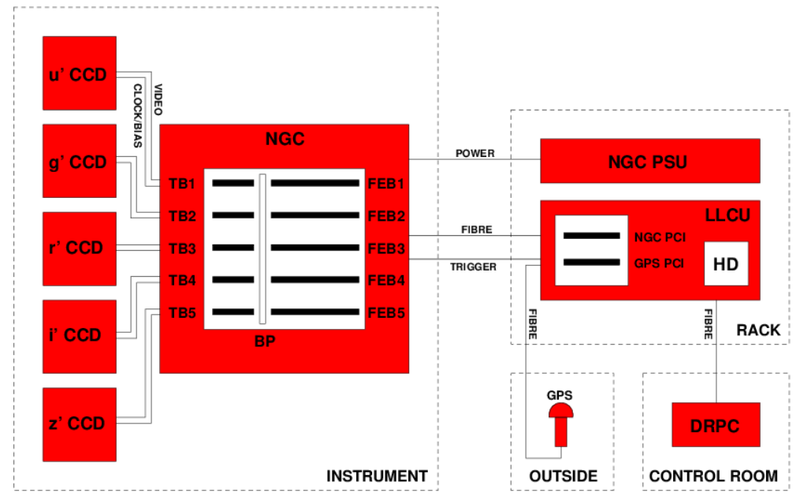 The trigger cable running between the LLCU and the NGC is used for GPS timestamping. The external GPS antenna is connected via fibre to the LLCU. Another fibre connects the LLCU with the data reduction PC in the GTC control room. 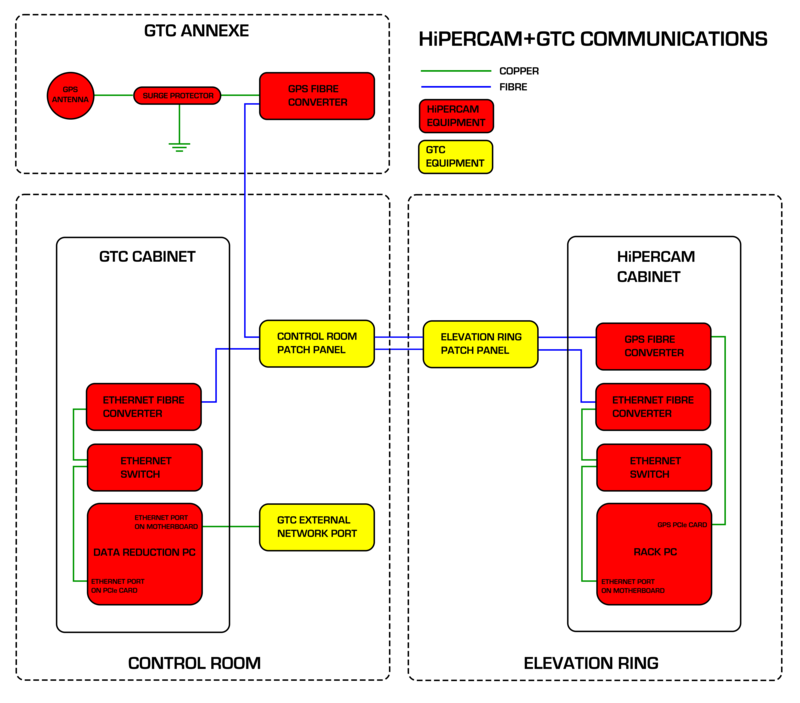 Hardware components of the HiPERCAM data acquisition system (left) and their connections (right). The data acquisition system (DAS) in HiPERCAM is detector limited, i.e. the throughput of data from the output of the CCDs to the hard disk on which it is archived is always greater than the rate at which the data comes off the CCDs. This means that the instrument is capable of running continuously all night at its maximum data rate without ever having to pause for archiving of data. All CCDs are read out simultaneously and have identical exposure start and end times. In order to change the exposure times of the CCDs with respect to each other, it is possible to skip the readout of selected CCDs using the NSKIP parameter. For example, if NSKIP is set to 3,2,1,2,3 for the ugriz CCDs, and the exposure time is set to 10 s, then the CCD controller will read out only the r-band CCD on the first readout cycle (giving r a 10 s exposure), then the g, r and i-band CCDs on the second cycle (giving g and i a 20 s exposure), then the u, r and z-band CCDs on the third cycle (giving u and z a 30 s exposure), etc. The HiPERCAM graphical user interface (GUI) is shown below. The top right of the GUI shows three buttons that allows the astronomer to change the readout mode: full frame, windowed or drift mode. Below this are the various CCD readout parameters, giving the astronomer complete control over the detector setup. The number of exposures is usually set to zero in the GUI and the green Start button is then pressed: the data acquisition system will then take data continuously until the red Stop button is pressed. 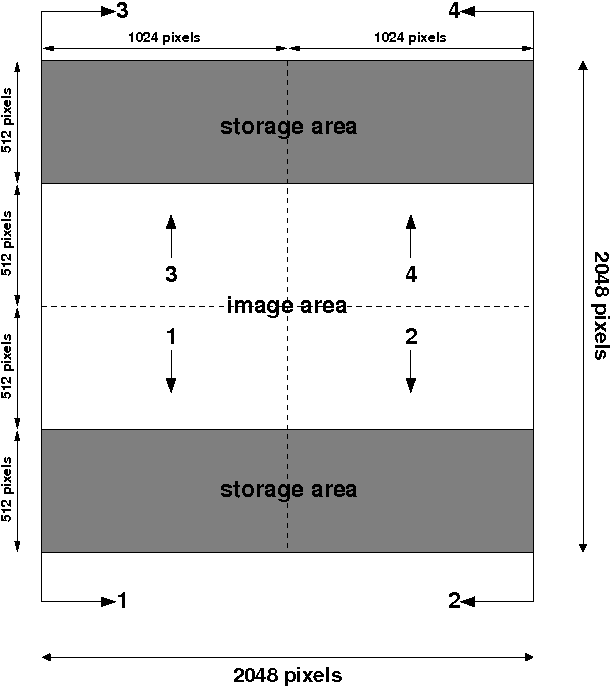 All frames of a HiPERCAM run on a target are written to a single, custom-format FITS file. A screenshot of the python-based HiPERCAM GUI, used by astronomers at the telescope to control the instrument. 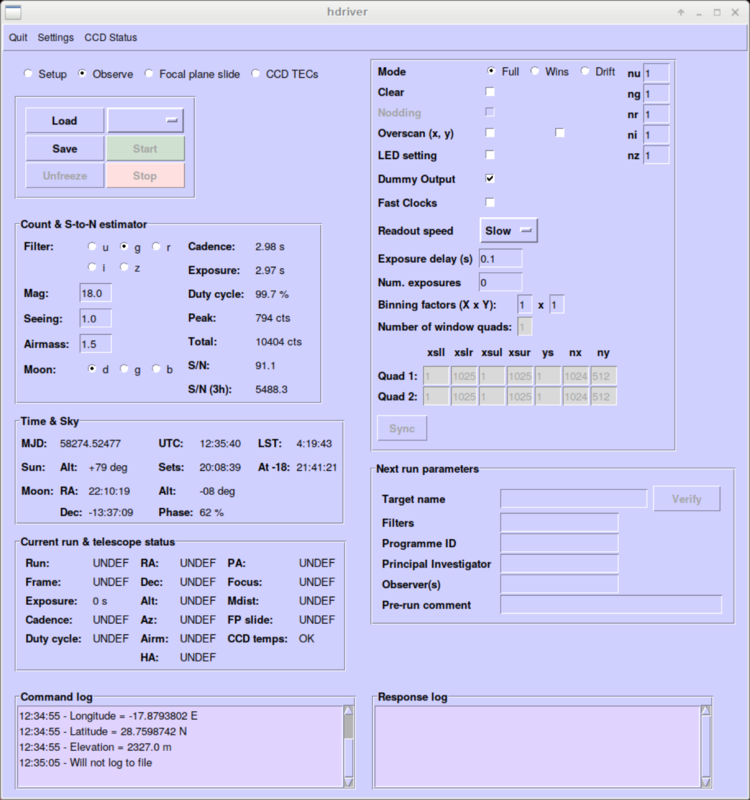 There also exists an engineering GUI for low-level control and telemetry of the CCD controller. HiPERCAM writes its data to FITS cubes, with one cube representing one run on a target. Each plane in the cube contains data from all 5 CCDs at a particular time; since all 5 CCDs in HiPERCAM are exposed and read out simultaneously, only a single timestamp is written for all 5 frames. The FITS cubes also contain a full set of standard headers, such as the CCD and telescope parameters. HiPERCAM can generate up to 20 MB of data per second. In the course of a typical night, therefore, it is possible to accumulate up to 720 GB of data, and up to 5 TB of data in the course of a typical week-long observing run. In order to handle the high data rates, HiPERCAM has a dedicated pipeline data reduction system, based on the successful ULTRACAM pipeline. The data reduction pipeline grabs raw data as soon as it has been read from the CCDs and written to disk, and then processes it in real time, keeping up with all but the highest frame-rates. The HiPERCAM data reduction pipeline has been designed to serve two apparently conflicting purposes. Whilst observing, it acts as a quick-look data reduction facility, with the ability to display images and generate light curves in real time. 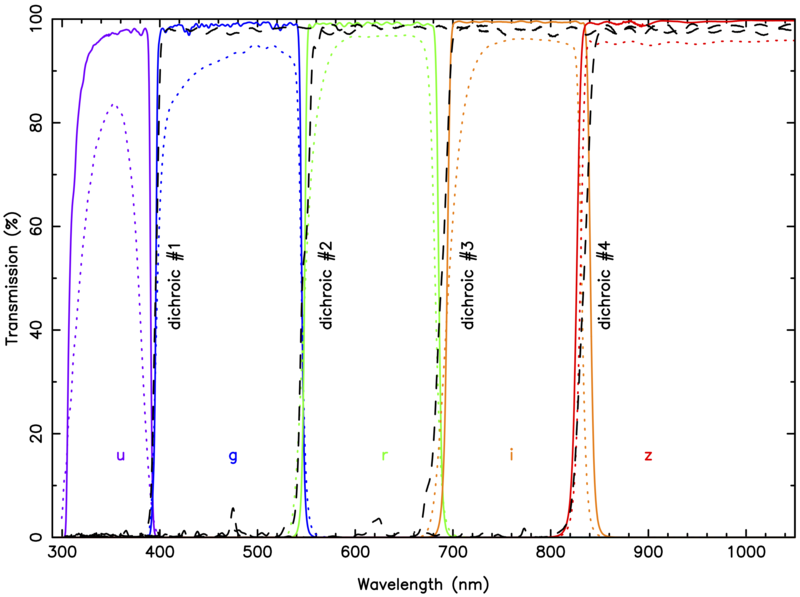 After observing, the pipeline acts as a fully-featured photometry reduction package, including optimal extraction. To enable quick-look reduction whilst observing, the pipeline keeps many of its parameters hidden to the user and allows the few remaining parameters to be quickly skipped over to generate images and light curves in as short a time as possible. Conversely, when carefully reducing the data after a run, every single parameter can be tweaked in order to maximise the signal-to-noise ratio of the final data for detailed analysis and publication. The HiPERCAM data reduction software also provides an “Application Programmers Interface” (API) to allow users to access and manipulate HiPERCAM data. This will be of interest to anyone who wants to code their own scripts. You can download and obtain all of the information related to the HiPERCAM data reduction software here. The HiPERCAM pipeline stores individual multi-CCD exposures in files with extension .hcm. These are in fact FITS files that can be examined with e.g. fv, ds9, fitshead, but the extension .hcm is used to distinguish them clearly from the raw .fits files and to reduce the chances of overwriting the latter. Further information can be found here. Screenshot of the python-based HiPERCAM data reduction pipeline. The top row shows a zoom-in of the ugriz images of the target and comparison stars, with the apertures defining the object and sky regions superimposed. 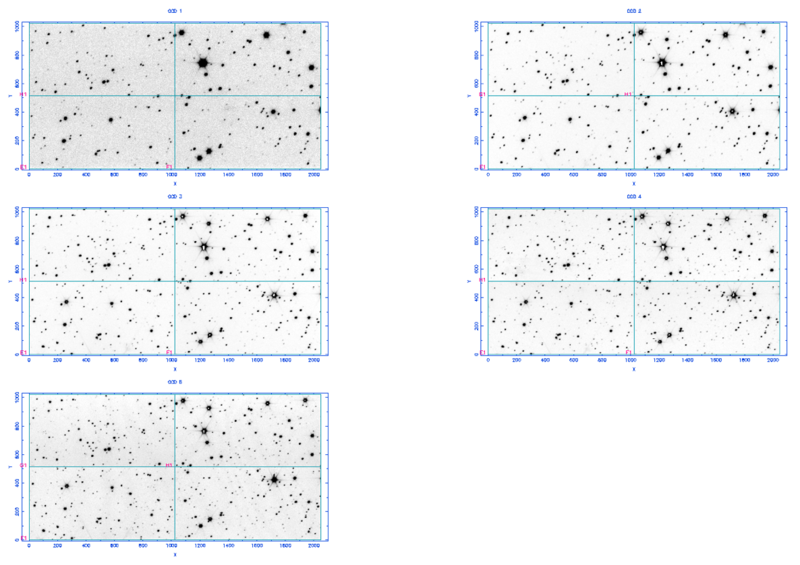 The bottom panel shows the target minus comparison star magnitudes in ugriz (top row), the comparison star x,y positions (second and third rows), the sky transparency measured from the comparison star flux (fourth row), and the seeing in ugriz measured from the comparison-star FWHM (bottom row). HiPERCAM was commissioned on sky for the first time on the WHT during October 2018. This was a short run of only 1 commissioning night and 4 science nights, and was intended primarily to be a shake-down of the instrument prior to commissioning on the GTC. The instrument was then moved to the GTC, where it was allocated 3 commissioning nights and 10 science nights in February 2018. Due to terrible weather, the instrument was used on sky for only the last 3 nights, but this did allow all of the commissioning to be completed. Three more observing runs followed in April, May and June 2018, totalling 16 nights. A wide range of science was performed during this time, including the observation of black holes, white dwarfs, neutron stars, brown dwarfs, extrasolar planets/asteroids, AGN, FRBs, GRBs, SNe and ultra-diffuse galaxies. An example star field observed with HiPERCAM on the GTC is shown below. The FWHM of the stars in these images are u = 0.56'', g = 0.44'', r = 0.41'', i = 0.37'', u = 0.36'', with no discernible variation with field angle. This indicates that HiPERCAM on the GTC can provide seeing-limited images across the whole field of view in even the very best seeing conditions on La Palma. Since the dichroics operate in a collimated beam and have anti-reflection coatings on their rear surfaces, no ghosting is expected in the images: a careful inspection of the brightest stars in the images below reveals that there is indeed no discernible ghosting. 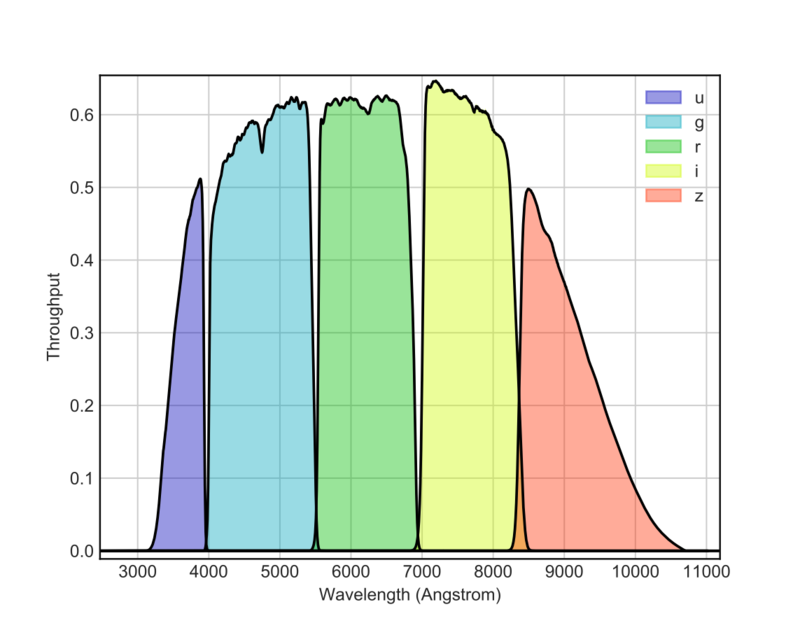 The pixel positions of the stars at the corners of the field of view are the same on all 5 CCDs, to within approximately 5 pixels (75μm), indicating that there is no discernible variation of platescale with wavelength and that the CCD heads are well aligned with respect to each other. Twilight-sky flat fields show no discernible vignetting in the corners of the field of view. The measured photometric zero points of HiPERCAM on the GTC, defined here as the magnitude of a star that would give 1 electron per second above the atmosphere, are: u = 28.17 (25.76), g = 29.25 (28.71), r = 28.76 (29.05), i = 28.43 (28.60),	z = 27.95 (28.04). The numbers in brackets show the corresponding values for OSIRIS, the common-user, single-channel optical imager at the GTC. These two sets of zero points were measured within a few days of each other during May 2018, using observations of SDSS standard stars. Images of a star field obtained with HiPERCAM on the GTC in u' and g' (top row), r' and i' (middle row), and z' (bottom row).